This article presents a new opportunity for organizations to improve their use of local media. The model I am introducing focuses on how you can produce and distribute your own mission-based content on a variety of channels without the time and market-based limitations of commercial and public broadcasting. 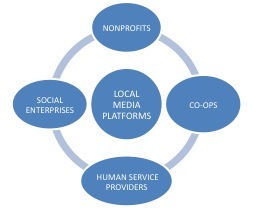 There are many ways media can serve people working for critical human connection – for understanding, cooperation, and collective action to improve life. The growing numbers of people involved with what I call "the emerging community economy" need and deserve more from their media. I created Human Arts Media to help organizations working for positive changes make better use of local media and Internet-based technologies. My focus is on serving this community of servers – nonprofits, cooperatives, human service providers and social enterprises. I share your core values and principles and the social goal for my professional work is to enable your success with a creative reinvention and reconfiguration of your local media environment. With a new media toolbox you can proactively create and manage your public communications. This can help you create a stronger and deeper relationship with the public that transcends random exposures, commercial clutter, and limited news coverage. And it is about more than just quantity of messaging; it is about quality. At the very least I hope this article will provide an opportunity for you to take a fresh and critical look at your own local media and reflect on what it is or is not doing for people in your community. Support it when you can and when you believe they have earned it. 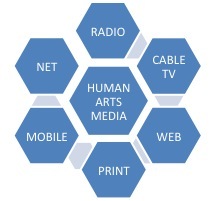 Human Arts Media (HAM) is a social enterprise based on the principles and practice of "Media in Service to Community." HAM provides strategic and contextual media consulting, technology training for staff/in-house/external communications, promotions/marketing support and multi-media production services. It functions as a media hub for continuous in-depth local service for clients. Imagine Human Arts Media as a traditional advertising or marketing agency with multi-media production capability. Instead of functioning as a private business to serve the priorities of owners and employees, it operates as a social enterprise which includes this alternative vision and serves to enable and empower the organizations that serve the community directly. As I complete the initial model tests and fine tune operations for future projects, one of my objectives is to generate a potential for employment opportunities for unemployed or underemployed creative media producers, especially those who long for more than just commercial work. So how does this model function? How are people served? What are the options? As a media support service HAM co-produces with clients a wide range of messages for specific media channels, either individually for short-term (or strategic) purposes or in combination as a designed longer-term campaign. Messages can be shared across all channels for maximum reach, or targeted for particular audiences. The scale of resources can match the scale of delivery desired. This media model enables a client organization to expand the content on its existing website – by creating its own audio and video production channel. All content produced by or for other media channels is also available on the client website. In essence, this new client-based channel can operate as a multi-media hub and function as the client's own local radio or TV station or newspaper. Human Arts Media works with local media producers and content providers on your behalf, to facilitate access to local programs and expedite the process of getting your messages out. This agency-level support can be delivered without the additional cost of agency or consultant overhead – which usually covers non-project related operating expenses, such as costs for renting or owning offices/buildings, utilities, taxes and other labor. The HAM business model functions and provides support beyond the parameters and concerns of most commercial media service providers. As exclusively private concerns, commercial providers primarily focus on covering overhead and maximizing profits for investor/owners. They are generally less interested in working on smaller (less profitable) projects for clients with limited resources. They may have less interest or ability to work with clients who are new to media or who are unsure of how to include media in their development plans. The HAM model is cost-effective, affordable and can serve any organization regardless of size or age. A larger organization or association with more resources can choose a group purchase/discount of services to support several programs/members at one time. Promotions for fundraising campaigns or special events. Increasing general public awareness of existing or new programs and services. Public messaging in support of legal or other social/economic initiatives that will impact clients or the people you serve. Creating custom content in support of grant applications — or to archive/document work done for grant project reporting or renewal. Scenario #1 — to support a special fundraising event. HAM can co-produce client content for its website and arrange a schedule of client appearances on local radio or TV programs and news coverage. The local media content produced can be copied and placed on the client website for repeated exposure to reach people who missed it the first time around. Also, public service announcements can be produced for the client website and local channels, to offer additional promotion above and beyond any individual programs. In addition, email and other Internet-based social and local web channels can be targeted with appropriate and timely messaging as needed before and after the event. Scenario #2: to support a long-term capital or other larger-scale initiative. such as finding or building a new organization headquarters or launching a program funded under a new grant. HAM can expand the scale presented in Scenario #1, with more repetition and variety of messaging on the client-based channel and other local channels. A schedule for production and distribution can be established that would track along with the overall timetable and milestones for the ongoing campaign as a whole. Interview program appearances, news stories, talk-show guests, call-ins, PSA's. Work with all local stations, regardless of format. It's not about the music. Match client content to radio format and audiences reached. Adding website links for mutual cross-promotion and long-term support. All radio-related content should be available on client website channel. Appearances on all local programs with related topics or themes. Archiving programs on cable TV websites for 24/7 on-demand viewing. Making copies of locally-produced TV programs available to all other regional cable access channels within the client service area. Using community bulletin board TV channels for awareness building. All TV-related content should be available on client website channel. Appropriate and timely stories about services, programs or events. Identifying local reporters with interests in client-related activity. 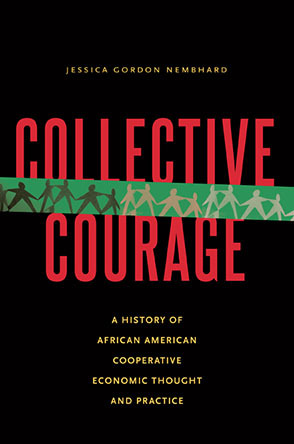 Special linkages with publications reaching communities of color. Preparing informational ad inserts for targeted local publications. All print media content should be available on client website channel. Mobile and social media are excellent for very fast and efficient personal communications, but using them for sustainable business purposes requires careful consideration of maintaining these relationships once established. Social media for advance promo of specific events, coverage during events and follow-up afterwards. Traffic can always be referred to the client website. Social media for in-house communications where useful and appropriate. Sometimes in-house staff is already active with social media, and they can provide appropriate support and control as needed, depending on the overall media plan and mix of messaging. This is an excellent media environment for building longer-term cross-promotional partnerships with appropriate (non-competitive) service partners, as well as other community service organizations. There is a wave of development happening with respect to local community or business webs, and this emerging locally-focused use of the Internet is creating a valuable network to engage the public for information and messages. Building web linkages with area or regional networks and associations of related interest or service is another underdeveloped area for client sustainability. As competitive as the funding environment is today, organizations need to create new options for collaboration and mutual support, beyond short term survival. All of these tools can be employed, with a narrow and strategic focus on individual channels when appropriate, or with a campaign featuring a planned mix of channels with different but related messages. The Human Arts Media model is scalable, flexible and efficient, at any level of funding or other support. In all potential scenarios, the momentum and efficiency is created by the collective mix of all messages in all channels over time. Moreover, all content can direct people to the client's own website and media channel, which serve as the hub for all public communications. This completes the circuit of the Human Arts Media model in action – as a holistic, self-directed and client-based media strategy in action. I share these thoughts with the GEO community now because as much as I am working hard to implement this model in my local region I am also looking for partners for testing in other areas. We can collaborate to design specific projects with defined parameters and mutual goals. Small tests can provide results for sharing and possible expansion of areas that are working well. The media content co-produced by GEO readers with the HAM model can easily complement existing promotions and other development activity already underway. The stories, information and documentation materials produced can be shared with partners and leveraged with the work of other collaborators to create a larger communications resource for the GEO family as a whole. With the testing and implementation of this model we can finally bypass traditional corporate structure and control, as well as the limitations of the commercial and public broadcasting models. We can move forward with our own purpose and proactive agenda: local survival, sustainability, justice and opportunity. I leave you with my thanks for sharing your time, and my best wishes for success with all the good work I know you are doing. If you are interested in learning more about Human Arts Media and how it may serve your efforts feel free to contact me. [*]Editor's Note: John is preparing two additional articles for GEO that will focus on extended applications of the Human Arts Media model. These applications are designed for projects involving two or more partners in collaboration to achieve larger goals. One application expands the service relationships between noncommercial radio stations and people and organizations in their local communities. The other is intended to facilitate cooperation and mutual support between organizations involved with the "emerging community economy" that usually operate in isolation rather than as partners. This higher level of mutual concern and action to achieve larger long-term goals is embedded in the HAM model and is based on the 6th Principle of Cooperation. John Murphy is a 40-year radio veteran and community media activist. A continuing focus for his work has been on radio station management, consulting and networking, as well as increasing public access to technology in service to human and community development. John is a Goddard College alumnus — with a BA in media studies and community development and MA from the Socially Responsible Business and Sustainable Communities (SBC) Program. John currently serves as Adjunct Faculty in the Communications Department at Eastern Connecticut State University and is producer of the weekly "Pan American Express' program on WECS Radio. John also co-produces and hosts the community TV program series On the Homefront (560 programs in 15 years). John is also Owner/President of Human Arts Media, a community media consulting and production company. In 2008 he received a State of Connecticut General Assembly Official Citation Award for 30 years of public service in college/community radio. In 2011 John received a Wavy Gravy Basic Human Needs Award from the Seva Foundation for media service to the arts and local communities. Another World Emerging? Well, Maybe.